A study from UT Southwestern's O'Donnell Brain Institute provides novel insight into the shape-shifting nature of a tau molecule just before it begins sticking to itself to form larger aggregates. The revelation offers a new strategy to detect the devastating disease before it takes hold and has spawned an effort to develop treatments that stabilize tau proteins before they shift shape. Dr. Mark Diamond, Director for UT Southwestern's Center for Alzheimer's and Neurodegenerative Diseases "This is perhaps the biggest finding we have made to date, though it will likely be some time before any benefits materialize in the clinic. 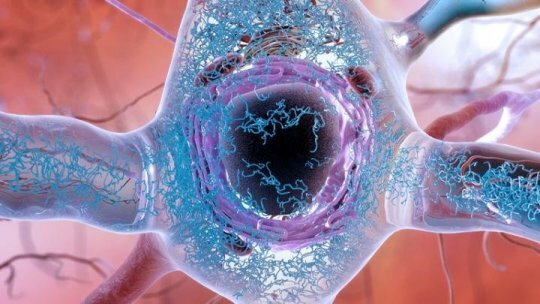 This changes much of how we think about the problem," said Dr. Marc Diamond, Director for UT Southwestern's Center for Alzheimer's and Neurodegenerative Diseases and a leading dementia expert credited with determining that tau acts like a prion -- an infectious protein that can self-replicate. The study published in eLife contradicts the previous belief that an isolated tau protein has no distinct shape and is only harmful after it begins to assemble with other tau proteins to form the distinct tangles seen in the brains of Alzheimer's patients. "We think of this as the Big Bang of tau pathology," said Dr. Diamond, referring to the prevailing scientific theory about the formation of the universe. "This is a way of peering to the very beginning of the disease process. It moves us backward to a very discreet point where we see the appearance of the first molecular change that leads to neurodegeneration in Alzheimer's. This work relied on a close collaboration with my colleague, Dr. Lukasz Joachimiak." Despite billions of dollars spent on clinical trials through the decades, Alzheimer's disease remains one of the most devastating and baffling diseases in the world, affecting more than 5 million Americans alone. His team's next steps are to develop a simple clinical test that examines a patient's blood or spinal fluid to detect the first biological signs of the abnormal tau protein. But just as important, Dr. Diamond said, efforts are underway to develop a treatment that would make the diagnosis actionable. "The hunt is on to build on this finding and make a treatment that blocks the neurodegeneration process where it begins," Dr. Diamond said. "If it works, the incidence of Alzheimer's disease could be substantially reduced. That would be amazing." Dr. Diamond's lab, at the forefront of many notable findings relating to tau, previously determined that tau acts like a prion -- an infectious protein that can spread like a virus through the brain. The lab has determined that tau protein in the human brain can form many distinct strains, or self-replicating structures, and developed methods to reproduce them in the laboratory. He said his newest research indicates that a single pathological form of tau protein may have multiple possible shapes, each associated with a different form of dementia. Dr. Diamond, who holds the Distinguished Chair in Basic Brain Injury and Repair, is founding Director of the Center for Alzheimer's and Neurodegenerative Diseases, and Professor of Neurology & Neurotherapeutics with the Peter O'Donnell Jr. Brain Institute at UT Southwestern. He collaborated on the study with co-corresponding author Dr. Joachimiak, an Assistant Professor in the Center for Alzheimer's and Neurodegenerative Diseases and an Effie Marie Cain Scholar in Medical Research.